In this post I will talk about some shocking facts about mughal empire in India. By Mughal Empire, I refer to the generic Islamic period of India starting with Mahmud of Ghazni and ending with Bahadur Shah Zafar with the advent of the British, spanning almost 800 years. According to historian Will Durant, "The Islamic conquest of India is probably the bloodiest story in history". By the estimate of Koenraad Elst the population of Indian subcontinent reduced by almost 80 million between 1000 and 1525. Mahmud of Ghazni invaded India 17 times. He was a Jihadi of the highest order and killed hundreds of thousands of Hindu and Buddhists including monks, women and innocent children. I have shared 5 Shocking facts about Mahmud of Ghazni earlier. Mahmud of Ghazni along with his favorite homosexual lover was Malik Ayaz , a Georgian slave, went on a rampage in India destroying more than a 1000 Hindu temples and Buddhist monasteries and killing hundreds of thousands of Hindu and Buddhists including monks, women and innocent children. Bakhtiyar Khilji was a terrorist invader from Turkey in the 12th century. He was a genocidal maniac who killed thousands of indigenous Indians and destroyed major places of education and worship of Hindus and Buddhist. Bakhtiyar Khilji destroyed Nalanda University and slaughtered all its Buddhist and Hindu Monks. Bakhtiyar Khilji was responsible for the decline of Buddhism in India. Read more on the barbaric way in which Bakhtiyar Khilji conquered Bengal and Bihar. Babur was a conqueror terrorist from Central Asia who founded the Mughal Dynasty in India. I have shared 3 shocking facts about Babur here. 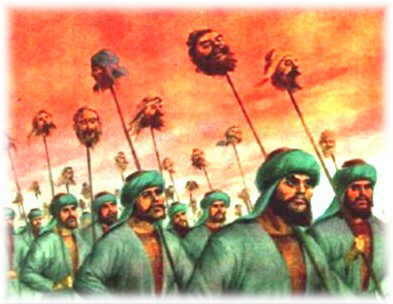 Babur used to massacre innocent people wherever he went. He loved to behead people and to create stack of pagan (Hindu, Afghan, Buddhist, Jain) heads and to sit in his royal tent to watch this spectacle. Babur is notorious for demolishing the Ram Temple at Ayodhya and building Babri Masjid there. Babur is rightly to be called the founding father of communal tension in India and he is responsible for all communal riots even today. That's it. Thank you for reading shocking facts about Mughal empire in India. Please show your appreciation by sharing and/or leaving a comment.